An example of a rosary, used in some forms of Roman Catholic prayer. We visited a person’s Twitter profile the other day, and on it, they exhorted people to “Pray the Rosary as the Blessed Mother Taught Us”. We’ve always viewed the rosary as one of the accretions of dogma/ritual that have come from nowhere and become part of the Catholic tradition, and certainly never found any passage in the Bible where Mary taught people how to pray a rosary. Nonetheless, these words had us reaching for a Bible and searching it for a suggestion or authority about the concept of praying a rosary in any form at all. We also had a second thought, in anticipation of failing to find any Biblical support for using a rosary to pray – even if it is not recommended/required in Biblical teaching, is it a good and good way to communicate with God? Before answering those two questions, let’s start at the beginning. Unless you come from a Catholic background, you probably don’t know exactly what a rosary is or what the process of “praying the rosary” involves. We should explain what it is, first. The rosary itself, as illustrated immediately above (image from catholiccompany.com who sell rosaries) is a necklace of beads with a pendant hanging from it. One steps around the necklace, bead by bead, repetitively saying a series of different prayers on each bead. There are five sets of ten beads plus larger beads between them on the necklace; on each small bead one says (or thinks) a “Hail Mary” prayer. The other beads denote various other prayers and invocations. This is all well explained on various websites such as here and here. The purpose of the rosary is to help a person do the entire sequence of prayers without miscounting – you move your fingers from bead to bead as you go through the prayer series. Most of the prayers for each step of the rosary are specific and you’re expected to repeat them exactly, word for word, but there can be some seasonal variations in the five “mystery” prayers. Saying a complete rosary involves 13 prayers, five of which vary from time to time, and in total, these 13 prayers are repeated 81 times. Non-Catholics are probably astonished at the veneration of this Biblical figure, but that’s a mystery for another time (although lightly touched on in our article about saints). Let’s instead focus on the two questions. Does the Bible Recommend a Rosary Style of Prayer? Unsurprisingly, we are given various advice in the Bible, both about how we should, and how we should not pray. 7 “And when you pray, do not use meaningless repetition as the Gentiles do, for they think they will be heard because of their many words. In the KJV, we are told even more clearly not to use vain repetitions as the heathens do. Jesus then “doubles down”. First he castigates people who use vain/meaningless repetition and calls them unGodly, and then he tells us not to be like them. Can this be any clearer? How can Jesus’ own words, speaking clearly and literally, be reconciled with 53 identical prayers in a row to the mother of Jesus (an unkind person would suggest that the act of praying to anyone other than the Holy Trinity is in and of itself a heathenish act)? 26 In the same way the Spirit [comes to us and] helps us in our weakness. We do not know what prayer to offer or how to offer it as we should, but the Spirit Himself [knows our need and at the right time] intercedes on our behalf with sighs and groanings too deep for words. 27 And He who searches the hearts knows what the mind of the Spirit is, because the Spirit intercedes [before God] on behalf of God’s people in accordance with God’s will. This is interesting in several respects. It shows us that we don’t need to ask someone else to intercede on our behalf, we don’t need to ask Mary, or someone who a Pope has decided should be called a saint, because God gives us the Holy Spirit – part of the Holy Trinity – who will help us with our prayer and intercede on our behalf. A similar concept is expressed in Ephesians 6:18.
Who would you rather have interceding on your behalf? The Holy Spirit? Or some dead person that some other person has presumed to be able to give special powers to? The word “groanings” in this pair of verses is constant through most of the translations, and we understand it to mean “non-verbal expressions of want, need, desire”. You don’t even need to clearly annunciate, in words, your feelings and your needs. You just need to open your mind and share your thoughts and feelings – your “groanings” rather than your words. Indeed, look up again at the earlier verses in Matthew, which tell us that God knows what we need before we ask him. The choice of words aren’t as important as is our state of mind. Words can help us get into that state of mind, but the key thing is to open our mind and our heart to God, and to focus on that, not on endless repetitions of words written by some mortal, many years ago. Why do you need a rosary to help you pray, when God says he (the Holy Spirit) will help? Even if a rosary has some value, who decides the exact number of repetitions? Why 81 – why not 80 or 82? Is any part of the construct of the rosary based on Biblical teachings? Where in a rosary are our requests specifically made known? 13 And I will do whatever you ask in My name [as My representative], this I will do, so that the Father may be glorified and celebrated in the Son. 14 If you ask Me anything in My name [as My representative], I will do it. Jesus encourages us to ask him directly for what we want. Nowhere – nowhere – does he tell us to ask anyone else to ask on our behalf. He tells us to ask him directly, and says that by doing so, we are glorifying God through Jesus. So not only does Jesus encourage us to ask him directly, but then Paul tells us that no-one else can help us on our behalf. So why then would you go to someone else, somewhere else in the company, to pass a message on, when the CEO has told you the COO is standing by, ready and willing to take your call and pass your message on? Even Without Biblical Support, is a Rosary a Good Way to Pray? We think not. Indeed, we see doing a rosary style of prayer as harmful rather than helpful. We see it as no more useful than the old punishment in school of “writing out lines” – being required to write out 100 or however many times phrases such as “I will not talk in class” or “I will write more tidily” or whatever. Being required to ritualistically step through 53 “Hail Mary” prayers, six each “Glory Be” and “Fatima Prayer” and “The Lord’s Prayer” prayers, and assorted other prayers, is monotonous, unimaginative, and more like punishment than pleasure. We view prayer as a conversation between us and God, in the form of the Holy Trinity. We chat with God semi-randomly during the day, when issues occur to us, in quiet moments, at times when we’re reminded of his presence in our life, or when we selfishly wish to express a request. Like all conversations, our prayers are essentially unscripted in nature. Yes, they include respectful salutations and acknowledgements of the Lord’s pivotal role, and general expressions of appreciation and willingness to serve his purpose any way we can. But he knows that already, and while it is polite and appropriate to wrap specific communications with such statements, nowhere does it teach us to repeat any prayer, let alone a prayer to someone other than the Holy Trinity, 53 times as part of a regular routine ritual. Besides which, after you’ve done the entire 81 prayer set, how much of what you have said is “you” personally, sharing your hopes, fears, and other personal issues, with the Lord? None. Nothing. Saying a rosary, largely not even addressed to any part of the God-trinity, distances you from the direct personal one-on-one relationship with God through Jesus and with the Holy Spirit that we are encouraged to seek out, experience, and enjoy. Imagine, as a child, if you wanted your friend Johnny to come out and play with you. Which would you rather do – ring up his mother and politely ask her if Johnny can come outside and play, or ring up a neighbor down the street, and repeat various phrases 81 times, hoping that the neighbor doesn’t just hang up the phone and somehow guesses from your strange speech that you actually want Johnny, from two doors down, to come out and play? We are encouraged to pray, and indeed, to pray a lot (eg Luke 18:1, 1 Thessalonians 5:16-18). 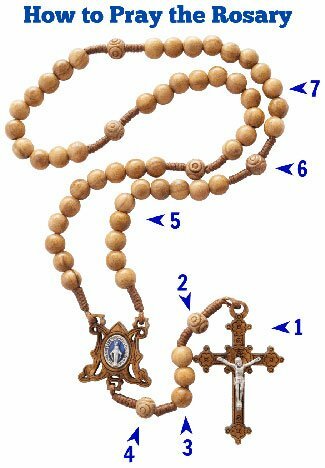 It could be said that going through the ritual of the 81 prayers of the rosary helps us to observe these recommendations. But we do not feel that saying a rosary is the same as praying to God. Clearly, 53 of the 81 utterances are not even directed to God, something we suggest displeases him, and the empty repetition is something Jesus told us not to do. So, what should you do if you can’t think of anything else to pray, and wish to still pray regularly during the day? We suggest two ways of how to engage in regular and appropriate prayer. The first is to prayerfully read the Bible. Read a chapter or two, starting your reading with a prayer for guidance and understanding, and ending your reading with another prayer for help in following the teachings in what you have just read and in becoming a better servant of the Lord. During the course of reading, pause reflectively and discuss what you are reading with God. We find that a great way of drawing closer to God, using his Word as a means to do so. The second way is to concede that perhaps there is some good in carefully using a “pattern prayer”. But don’t say a pattern prayer to Mary. Use the pattern prayer we are taught in the Bible itself, the Lord’s Prayer, and pray it meaningfully. As you go through it, pause and think specifically of examples of each. For example, “Give us this day, our daily bread” – there’s your chance to talk about what you need, want, hope for. For example, “And forgive us our sins, as we forgive those who trespass against us” – there’s your chance to mention specific sins you seek forgiveness for, and to specifically call out people you feel have wronged you, and ask for God to better guide them and to help you better understand and relate to them. For example, “And lead us not into temptation” – there’s a chance to reveal things that are troubling you and which have the potential to tempt you away from the good Christian life you’re seeking to lead. Ask for specific help with specific things. In this way, you are making the Lord’s Prayer into a meaningful dialog, rather than a hollow recitation of empty unconsidered phrases. Here’s a nice collection of other well-known “pattern prayers”. We stumble a bit over several of them, but most are excellent. We love to see people praying, and encourage you to do so more. But is saying a rosary truly praying? Does it please God to see people ritualistically counting off 81 repetitive prayers, including 53 to someone other than himself, and referring to a beaded necklace as a “Holy Rosary” when he has never made any reference to it, anywhere in the 750,000 words of the Bible? With all apologies to the many sincere and well-meaning Catholics reading this, we see no good in saying a rosary, and fear it is a misdirection of your worship. We are instructed that our prayers should be a meaningful dialog directly to God, via Jesus, and with the assistance of the Holy Spirit. Here’s a great article about prayer in general.